Well, I was sitting here and I had just got my club stamp kit from Fed Ex, this month there was a kit to make a purse Album, I didn't want to use the stuff from the kit, I think the papers would be better in cards, instead I used the pieces as a template and cut my own. 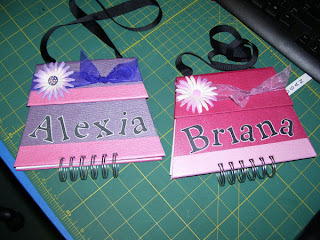 I used the new bazzill bling paper top cover the chipboard with. Anyway, these are the two books I made, I used my bind it all AGAIN, the ladies are teasing me that all I do now had to consist of using the bind it all :)). These two book are for my two g'daughters who are with us during the week and with mom and dad on the weekends. You should have seen their eyes light up as I showed them to them after getting their names and other decorations on them. I know the ribbon on ALexia's looks blue, but really, it is purple. Thanx for looking.